Growing up as a kid, my parents would often pack my brother and I into the car for the 4-hour drive down to Toronto. It was a "....occurence", since we often came down to Toronto, and so, I've become quite familiar with the GTA area over the years. I loved Toronto! I used to always pester my dad (half-jokingly, half-seriously) about moving down to Toronto, where there was always something to do, always something to see, and more importantly, always something delicious to eat. Now that I find myself living in the T-do, however, I often ask myself, "What have I gotten into?" When you have so many great restaurants only steps away from you, it's hard to sometimes find the motivation to go home and make something yourself, especially after a long day. And so I found myself in such a dilemma yesterday. 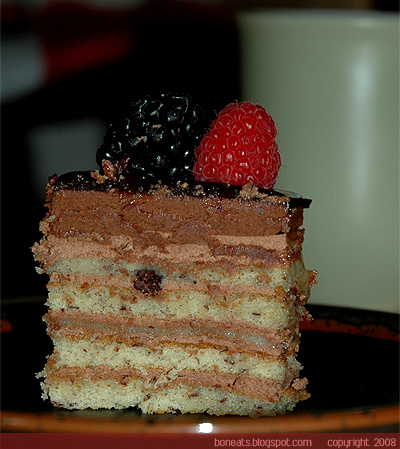 It was my mother's birthday, and while I would have loved nothing more than to bake her a cake myself, it just made life much easier to go out a buy her a cake from one of the many fabulous bakeries in the city. 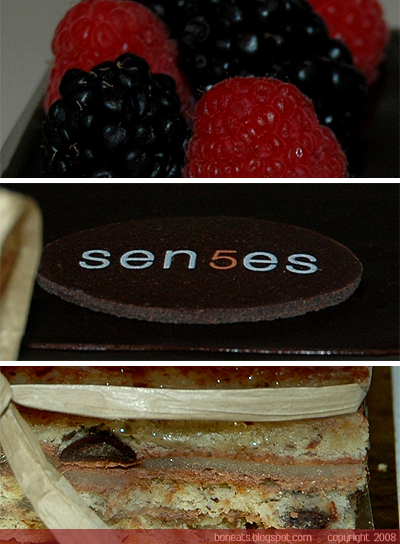 We used to love the cakes from Senses at their Bayview location until it closed down. After trying out their downtown location earlier this summer as part of the annual Summerlicious event in Toronto, we discovered that the pastries were still of high caliber. 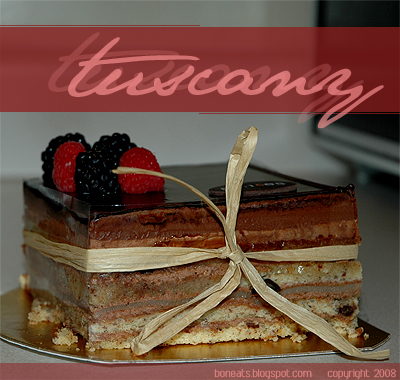 Went back yesterday to pick up Tuscany, a beautiful cake composed of hazelnut sponge, marzipan and rich chocolate ganache, with an equally beautiful, captivating name. Posted by Bonita at 7:08 p.m.